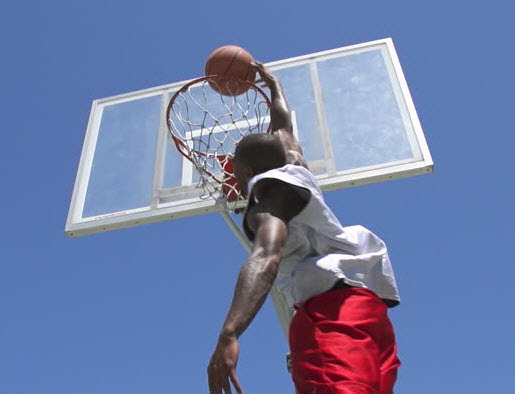 While football players often spend hours in the weight room, basketball players are more likely to spend time perfecting their jump shot than toning their muscles. The sad truth? Most basketball players neglect strength training -- and it's to their detriment. Obviously, you need to be able to put the ball in the hoop, but the benefits of strength training for basketball players are too valuable to be overlooked. Basketball players who strength train are less likely to be injured and, if they are injured, are more likely to come back to the court sooner than a non-trained athlete. Why? Not only does strength training build your muscles, but it also makes your bones denser. Stronger muscles also do a better job of supporting your most vulnerable points -- your knees and ankle joints, as well as your wrists and shoulders. Stronger athletes are likely to suffer a less severe joint sprain than an untrained athlete if they suffer an injury at all. And, they recover more quickly. A basketball player who strength trains is more likely to be better able to perform at a higher level for longer periods of time than an athlete who spends little or no time in the weight room. The efficiency with which a strength-trained athlete operates means that they are going to use less energy to move up and down the court than an athlete who never touches weights. But for many basketball players, spending time in the weight room is an anathema. They worry that lifting will make them less flexible, mess up their shot or put too much weight on them and limit their jumping ability. A properly designed program actually can improve jumping ability by several inches over the course of a season, especially in athletes who haven’t trained extensively, will add muscle that enhances a player’s ability to move with and without the ball and should include components that stretch muscles and help make an athlete more supple. Obviously, the best time to start training for your basketball season is several months before it starts, but there are still gains to be made in-season, and the benefits of strength training as a team are significant. For many basketball players, the idea of doing a lot of core training seems like a waste of time. But the core is where your stability and balance begins. Coming down with a rebound, trying to slice through a double team and even executing a smooth jump shot requires that your body is fully under control. There are a lot of programs out there that claim to give you great abs in three weeks, or buns of steel in just 10 minutes a day. The reality is that core work – and that’s the front of your body, the back, and your sides – is something that needs to be worked on consistently. Your core is the cylinder from the middle of your thighs to the top of your rib cage. Try to work a combination of twisting exercises, exercises that work your abs and movements that involve your mid to lower back and buttocks. Click here to see an assortment of core exercises. How much you bench press isn’t likely to play a major role in how well you shoot, but it will help determine how balanced you are physically, and that will have an impact on your shooting, just because it will determine how fluid and balanced your movements are. A good strength-training program looks at all areas of the body. What that means, is that a basketball strength-training program needs to look at all aspects of an athlete’s physical development. So, naturally, pushing exercises should be balanced by pulling exercises; lower body work should balance upper body work. In reality, in-season strength training for basketball tends to be constrained to short sessions twice a week, because most players will have games at least twice a week as well. And that’s fine. The key is to make every minute in the weight room count. An excellent way to get significant bang for the buck is to employ as many full body movements as possible. You can take that a step further by trying to get power and explosive work done at the same time. Sound impossible? Not really, you just have to commit to learning two or three classic lifts. The power clean is an Olympic lift that develops power and speed, will increase an athlete’s vertical jump and even works the core. As good as it is, Trophy Fitness trainers recommend that you can make it even better by adding a couple of other movements, a chain of ground-based, full body movements that pay significant dividends. The clean is the starting point, and you need to get the technique down pat. There are videos all over the web that show clean technique. After you execute the "clean" and are standing with the bar on your shoulders, you should adjust your feet a tad wider and lift your elbows in front of you and perform a front squat. When you return to a standing position, adjust your feet again and execute a push press, locking out the weight above your head. Return it to your shoulders, then to your hips and squat it back to the ground, your starting position for the power clean. Three sets of five is a great goal, and you don’t need to go very heavy to benefit. Test your strength levels before you start lifting. You’ll want to use between 65 and 80 percent of your maximum in your workouts … you can’t get stronger if you don’t struggle a bit. Set your weights and try to move up about two to five percent each week. Remember, many programs don’t lift at all in season; but if you’re getting a little stronger through the season, you’ll be considerably stronger than your opponent when the district and sectional games begin. Test your progress regularly and adjust weights accordingly. Try to work all areas of the body each time you lift. For large muscle groups, 3-4 sets of 5-8 reps is a good place to start. For smaller muscle groups, like biceps and triceps, 2-3 sets of 8-12 reps will give you good results. Use enough weight that you occasionally fail. In this case, failure often is a good measure of success.